Alas, as an indictment of our legal system, Court doesn't prick deeply, says Raja Sen.
An Indian courtroom is not a place you want to be. The universally slumped shoulders, the increasingly clerical lawyers, the incomprehensible antiquated legalese, all ticking away under a slow moving fan, creaking almost as slowly as the cases being argued. It is in this world that Chaitanya Tamhane's impressive directorial debut Court is set, and the director takes his time making us watch paint dry. 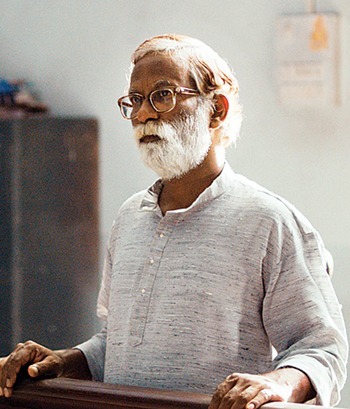 The case we follow in the film is patently absurd: 65-year-old folk singer Narayan Kamble has been tossed into jail because, the State claims, a song he performed about suicide incited a sewage worker to kill himself. Many a question is asked through the unbearably long trial -- Has he written a song like that? Does he sing about suicide? Does he have previous police cases against him? Is he an enemy of the State? -- but at no point does anyone even wonder aloud how, even if the song had caused a man to kill himself, the singer is culpable for the suicide. Tamhane, who dwells on every detail, makes it clear that the tiny technicalities matter while the big picture is much less important. Court, similarly, works far better in parts than as a whole. A highly understated film, it features some marvellous vignettes illustrating class divide and changing mindsets. The well-to-do defence lawyer strolls into a store and picks up three kinds of cheese, while the eagle-eyed prosecutor takes the local train home and muses dreamily about olive oil and whether it makes sense to buy the cheap kind advertised on TV. And while there are a lot of these moments that work individually, moments that viewers can carry home, taken together the points they make seem to be constantly, and repeatedly, laboured. The reason these individual scenes are so captivating have a lot to do with Tamhane's cinematographer Mrinal Desai, who composes his frames like a confident photographer would: You could frame a bunch of Court stills at random and gape appreciatively at them at the Jehangir Art Gallery. The shots are realistic and, for the most part, stunningly free of contrivance, and Desai masterfully ensures there is often some detail worth marvelling at: The shot of a worker at a printing press paginating a magazine, throwing different sections together with unthinking precision, motoring away at it again and again and again, while a man is arrested, is one of my favourites from this film. The film's cast is inspiringly good, especially Geetanjali Kulkarni as the public prosecutor, Pradeep Joshi as the judge and Vira Sathidar as the quietly dignified accused man, Narayan Kamble. Vivek Gomber, also the film's producer, is impressively understated as the defence attorney, but his performance is marred by the way he self-consciously wears his belly like a costume, drawing attention to it and sticking it out, completely at odds with the rest of his character. A constant problem with Court, however, lies in just how ghastly the film's extras are, with almost every person in a non-speaking role doing a jarringly bad job. A woman sitting in the front row of a propaganda-filled play nods along as she enthusiastically applauds the show, but the shot runs long and she just keeps agreeing, even though nothing else is said. Tamhane's predilection for making a shot tick on longer than we expect -- or, indeed, than it should -- is an interesting way to build up audience discomfort but the extras squirm harder than we do. Four friends walk into a bar, order four beers -- the bartender hands them two bottles of one brand, two of another, oddly enough, though nothing is specified -- after which they sit down and make small talk where they sound so unnatural that the screenplay may well have said 'friends make small talk' instead of writing lines. This, too, could have worked, but the shot runs longer -- which is an overall issue with Court, and which is a primary reason why, as an indictment of our legal system, it doesn't prick as deeply as genuinely pointed satire, like, say, Saeed Mirza's Mohan Joshi Haazir Ho. Court -- a singularly strong directorial debut -- gives us stunning snapshots which should work sensationally well for a festival audience, but, to the Indian viewer, are not truly new or holding any strikingly original thought. We know this, all of this. But perhaps the point Tamhane is trying to make is that it isn't important that we should know, but that we know better.